So you're ready to make a purchase from CityPass, just click a CityPass coupon codes provided here, and copy it. After that, just paste the code into the coupon box during checkout, your discount should appear automatically. With GetDiscountCoupon.com, you'll find only the latest citypass.com discount coupons. Visit 4 Hollywood attractions for just $59.00 CityPass price - $103.95 value! Visit 6 New York attractions for just $89.00 CityPass price - $162.00 value! SAVE 50% with Chicago CityPASS gives you VIP admission to 5 must-see Chicago attractions $84.00 CityPass price! Save 45% on 5 must-see Atlanta attraction admission tickets for just $69.00 CityPass price! SAVE 48% with San Francisco CityPASS Unlimited cable car rides & admission to 5 must-see San Francisco attractions - $69.00 price! Visit 6 Houston attractions for just $39.00 CityPass price - $69.96 value! SAVE 42% with Toronto CityPASS gives you admission to 5 must-see Toronto attractions - $58.40 price! SAVE 49% with Boston CityPASS gives you admission to 5 must-see Boston attractions $46.00 CityPass price! Visit 6 Seattle attractions for just $69.00 CityPass price - $121.20 value! Visit 6 Philadelphia attractions for just $59.00 CityPass price - $114.13 value! Save 49% when you visit Boston's Harvard Museum of Natural History and 4 other attractions with Boston CityPass - a $89.95 value! Never miss coupons from CityPass! Enter your email below and we will send you the latest and greatest CityPass deals. Save 50% & skip most tickets lines at 5 of Chicago's best attractions. You'll save time and money with a Chicago CityPASS®. Buy today. San Francisco CityPASS booklets contain six tickets: 1) Muni & Cable Car 7-Day Passport with unlimited rides on Muni cable cars, street cars, and buses for 7 consecutive days (compare: a single regular-fare cable car ride is $6); 2) California Academy of Sciences admission to 4-in-one attraction (natural history museum, aquarium, rain forest, planetarium) including exhibits and 3D theater; 3) Blue & Gold Fleet Bay Cruise Adventure one-hour narrated cruise (sails under Golden Gate Bridge); 4) San Francisco Museum of Modern Art admission; 5) Aquarium of the Bay admission; 6) an Option Ticket, with choice of either Exploratorium admission â€“ or de Young Museum and Legion of Honor â€“ admission to both (if visited on same day). Atlanta CityPASS booklets contain five tickets: 1) Georgia Aquarium Deepo Pass with Expedited Entry, Deepo's 4-D Theater Admission, AT&T Dolphin Tales Show (based on availability) and admission to changing exhibits; 2) World of Coca-Cola timed-entry admission, and a complimentary keepsake bottle; 3) Inside CNN Studio Tour admission; 4) an Option Ticket, with choice of either Fernbank Museum of Natural History admission, special exhibits and IMAX® film â€“ or High Museum of Art admission and special exhibits; 5) an Option Ticket, with choice of either Zoo Atlanta admission and All Rides wristband â€“ or Atlanta History Center admission. See our things to do in Atlanta page for more information. Connect with City Traveler before heading off to your CityPASS destination! 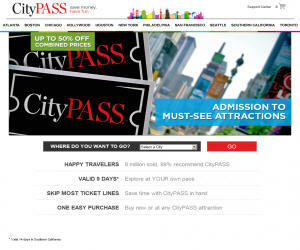 Once you have find the available Citypass.com promo code, choose the best Citypass.com code according to your needs because you can have multiple promo codes for Citypass.com. You should check any restrictions and policies before applying coupon, such as expiration date, because some coupons are valid for very short period, So if you need a Latest Citypass.com Promo Coupon / promotion code please BOOKMARK US (Ctrl + D) and check this site frequently. And one important thing some coupon codes are case-sensitive.